Google’s Gmail service offers vast amounts of storage, a unique approach to organization, one of the best e-mail-searching features around, and access to all your e-mail from any Web browser—all for the low, low price of free. And with a program such as Mailplane, you can even get many (though not all) of the niceties of a dedicated e-mail client. In fact, some people like Gmail so much that they’ve moved their old mail—perhaps years and years of messages filed away in Eudora—into Gmail, giving them searchable access to their archives from anywhere. The problem is that while Gmail makes it easy to import messages from other Webmail systems (such as Yahoo, AOL, or Hotmail), and you can import POP e-mail that’s still on your mail provider’s server, it hasn’t been a simple task to import older messages already on your computer. If you’ve got a Google Apps-hosted Gmail account—not a standard Gmail account, unfortunately—there’s now an easier solution: the open-source Google Email Uploader for Mac. 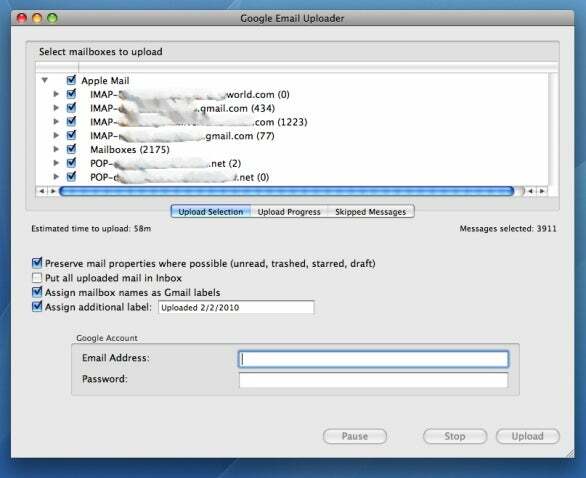 This utility provides a simple process for uploading your local e-mail to that Gmail account. When you launch Google Email Uploader, it displays any Mail, Eudora, or Thunderbird mailboxes it finds in their default locations. You can also manually point the program to messages—in Mail mailboxes, mbox files, or maildir folders—stored elsewhere. Unfortunately, you can’t upload mail from a Microsoft Exchange account, even if you access that account in Mail. Similarly, Entourage isn’t currently supported; you’ll need to first convert Entourage mail to one of the supported formats. You then choose your upload options: whether or not to preserve message properties (for example, read/unread, starred, or draft); whether or not to display the uploaded messages in your Gmail Inbox, and which labels to assign to messages. The program can automatically assign labels corresponding to mailbox names; so, for example, any e-mail messages in a Family folder in Mail will have a Family label when uploaded to Gmail. (Note that if you upload mail contained in subfolders—for example, in Work: Project B: January—those messages will get a separate label for each folder, rather than one long label.) You can also choose an additional label, such as today’s date, that will let you quickly view in Gmail all the messages included in this upload. One glitch reported by a user is that if your Internet connection is interrupted during the transfer, you must start over, which may result in duplicate messages; you should be sure you’ve got a reliable connection before starting. This is also a good argument for using the Assign Additional Label option to apply a unique label to imported messages: If the upload is interrupted, you can easily delete from Gmail any messages that were successfully imported, and then try the upload again. Google Email Uploader’s biggest limitation is that, because it currently uses the Google Apps Email Migration API, it doesn’t work with standard Gmail accounts; you need Google Apps-hosted Gmail. Granted, you can set up a Google Apps account, which includes 50 e-mail accounts and support for Google Calendar and Google Docs, for free. But setting up e-mail in Google Apps isn’t dead-simple, and if you’ve already got a Gmail account you’ve been using for a while, chances are you want to keep using it. Here’s hoping a future version of Google Email Uploader adds support for standard Gmail accounts.